is assistant professor of philosophy at Wellesley College in Massachusetts. The ancient city of Palmyra lies in ruins, which is saying something, since it was already a ruin to begin with (not originally, of course, but you take my meaning). Major damage has been done to the ancient structures at this UNESCO World Heritage site, casualties of the Islamic State’s ‘cultural genocide’, a campaign to annihilate Syria’s cultural heritage in order to demoralise the populace and attract attention to their cause. The Temple of Bel has been reduced to rubble, leaving only an empty doorway in its place. The Arch of Triumph was eerily cleaved in two, as if severed by a blade. Echoes of the destruction have reverberated beyond Syria, prompting international calls for the ruins to be reconstructed. Perhaps as a precursor to a whole new Palmyra, in 2016 the Institute for Digital Archaeology (IDA) in Oxford, leveraging advances in 3D-printing technology, reconstructed the Arch of Triumph in Trafalgar Square in London and in City Hall Park in New York. But isn’t the idea of replicating antiquities absurd? Isn’t it the very ancientness of the architecture that we prize? Modern facsimiles can seem poor replacements for objects whose value was largely a result of their age. 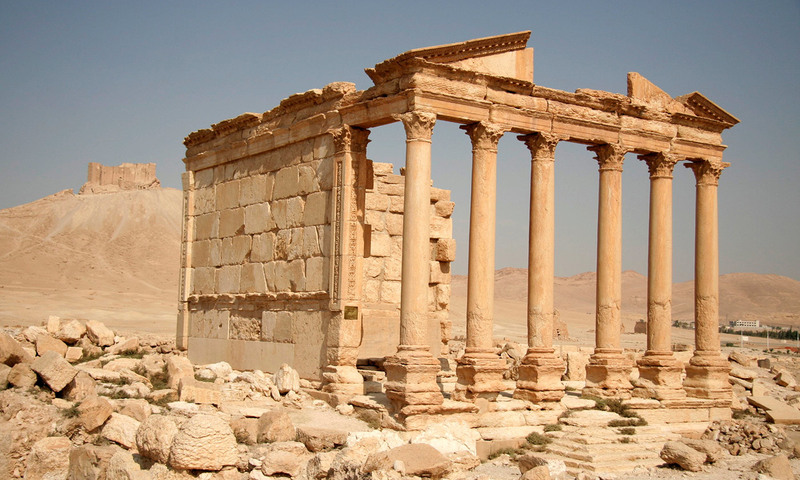 In The Guardian, the art critic Jonathan Jones urged that Palmyra ‘must not be turned into a fake replica of its former glory’, claiming that ‘what is never legitimate is to rebuild ancient monuments using modern materials to replace lost parts’. And the archaeologist Bill Finlayson of the Council for British Research in the Levant cautioned that ‘the dangerous precedent suggests that if you destroy something, you can rebuild it and it has the same authenticity as the original’. These objections assume that authentic replacement is the point of historic restoration. But it needn’t be. Historic restoration should not simply recreate what has been lost. Instead, it could deepen engagement with history and increase concern for the preservation of artefacts. A broader understanding of cultural heritage presses beyond the mere celebration of ancient objects to a more critical awareness of our connection with history. The aim of historic restoration is not to recover material authenticity, but to restore our relationship with the past. This proposal borrows from an environmental debate over the attempt to renew degraded areas of nature by means of environmental engineering – a human intervention into nature to recover what humans have destroyed. In his article (and then book) ‘Faking Nature’ (1982), the philosopher Robert Elliot argued that environmental restoration was incoherent. Human intervention in nature is ‘unnatural’, and can therefore only fake the non-human processes that govern natural spaces. He thought that the value of nature resided in its very independence from human control. Thus to tinker with nature is necessarily to pollute this value. In response, the philosopher Andrew Light argued that environmental restoration should be understood not in terms of perfectly repairing ecological damage but as a way of restoring our relationship with nature. This is the approach that should be applied to historic restoration too. But what does it mean? For one, it is a matter of increasing awareness. Many archaeologists have bemoaned how few people cared or even knew about Palmyra before it was attacked. Now that it has attracted the world’s attention, maintaining it will require more than the spectacle of wanton destruction. Recreating parts of the city through 3D printing can offer a robust sense of what’s been destroyed. People can see and touch these replicas, and more easily grasp the magnitude of the loss. This tangibility brings it home in a way that textbooks and articles alone cannot. The more people feel the power of these monuments and artefacts, the more they might be able to better understand the motivation for destroying them. In a future of unprecedented technological and environmental change, historically significant artefacts and sites become increasingly precarious. It is crucial to motivate people to prevent further damage. However, there is more than the preservation of mere artefacts at stake. Even when people do regard the past as important, they tend to embrace the triumphal while ignoring injustice. In The Atlantic in 2013, Ta-Nehisi Coates wrote: ‘“The past” is whatever contributes to a society’s moral debts. “Heritage” is everything else.’ And in his book The Heritage Crusade and the Spoils of History (1998), David Lowenthal remarked: ‘History seeks to convince by truth and succumbs to falsehood. Heritage exaggerates and omits, candidly inverts and frankly forgets, and thrives on ignorance and terror.’ Along these lines, some worry that historic restoration projects fail to cultivate a concern for true history, presenting instead a ‘Disneyland’ version of archaeology. Rather than representing the past, reconstruction of Syrian antiquities might provide unwarranted propaganda for the Assad regime (equally complicit in their destruction) and divert attention from the suffering the state has caused throughout the civil war. But it doesn’t have to be this way. Heritage presents a specific kind of relationship to the past, and restoration can prompt us to rethink it. Rather than obscuring the truth, reconstruction can make explicit how history matters today, and where different communities stand in relation to that past. To do this effectively, these projects need to be contextual, collaborative and self-critical. To challenge rather than just celebrate. Unfortunately, many of the Palmyra reconstructions have not met these criteria. The IDA failed to give context to its 3D-printed Arch of Triumph. It lacked adequate programming or signage, and didn’t explicitly connect with the violence that led to it. Together with Syrian archaeologists, the project could have been used to educate the West about colonialism in Syria and its continuing legacy, but instead it was mere spectacle. (Contrast this with the work of the Iranian-American artist Morehshin Allahyari, who uses 3D printing of ancient statues to draw attention to colonialism.) Syrians who live in and around the cities of damaged UNESCO World Heritage sites are finding innovative ways to reclaim and repair buildings – what might they do with the millions spent on 3D printing projects in Western nations? The fact that Palmyra and Bosra al-Sham are World Heritage sites does not mandate universal claim to these places and their antiquities. Rather, it’s a global call to think critically about our relationship to these places, their pasts, and what responsibilities those relationships might carry with them. For better or for worse, the West has an appetite for antiquities, and the spectacle of a 3D-printed triumphal arch could be used as an anchor for education. The recent increase in attention to protecting cultural heritage (from special encouragements by the National Endowment for the Humanities in the US, to the theme of the UN Global Colloquium of University Presidents at Yale in 2016) has focused primarily on technology and artefacts, but this fascination could be better harnessed. Once the obsession with material authenticity is set aside, it becomes clear that cultural heritage includes not just ancient arches but moral debts and political lessons. Restoration projects that rekindle our relationship with history could pave the way for greater understanding of heritage – not only as a past to celebrate, but also a past from which to learn.